Calling all fabric lovers! We’ve got an awesome giveaway from an equally awesome fabric shop! 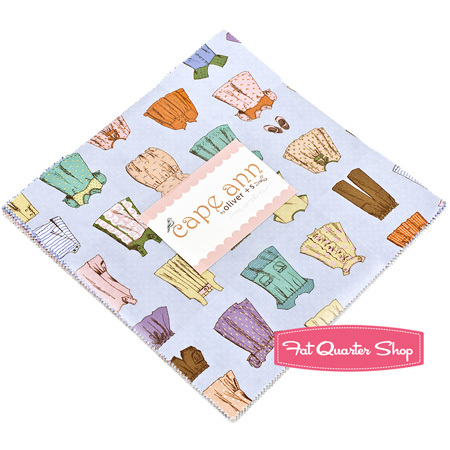 Fat Quarter Shop is the perfect online one-stop shop for all your fabric needs! If you like to buy fabric by the yard, the jelly roll or even a whole quilt kit, you can find beautiful designer fabric and have it delivered right to your door…ya gotta love that!! Who doesn’t love Moda Fabric? Fat Quarter Shop has an super-sized collection of fabric from Moda…I love that! This bundle of fabric is perfect for your Summer projects! I love to work with layer cakes and this one stole my heart the moment I saw it. I’m sure I can come up with a few fun ideas for this collection of sweet fabric. 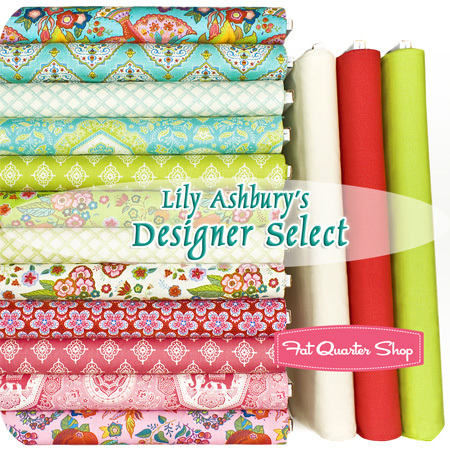 You’ll find beautiful fabric designed by Lily Ashbury available exclusively at Fat Quarter Shop. Great colors! We all know I could go on and on about the fabric selection available at Fat Quarter Shop, but you really need to check it out for yourself. The fabric is sent out “sew fast” that you will be creating something beautiful in no time flat. I know many of you are starting on beautiful Summer sewing projects right now. If you need a few more ideas, just check out our list of 101 Sewing Tutorials for Summer…it will keep you busy! 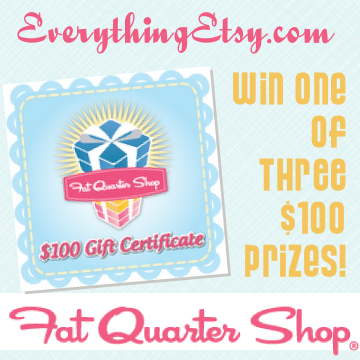 Fat Quarter Shop is giving away 3 $100 gift certificates!! You know you want to win this! Enter your name and email address in the box just below. You’ll be subscribed to the EverythingEtsy.com email newsletter and the Fat Quarter Shop email newsletter. You can gain additional chances to win by helping us spread the word about the giveaway. Links are provided below for Twitter, Pinterest, Facebook, and Google+. You can gain one entry per social share, up to a maximum of four extra entries per contestant. You must leave a comment below for each additional entry and your comment must include the name (username) you use for the social media platform associated with that entry. So if you enter for tweeting something, include your twitter @username so we can verify your entry. No additional entries are eligible to win without completing the required email entry above. You can unscubscribe from the email newsletters at any time, but only active subscribers are eligible to win the giveaway. I tweeted about this contest and started following you on Twitter. Google+ it 🙂 Cutemousey is the username for that or its under my name. I love the Fat Quarter Shop! I love fabric! And I’d love to WIN fabric. Yay! I love Fat Quarter Shop! Just tweeted @plaidcupcake! Excited to win! Pinned to Pinterest via Becky Greene. Facebooked, Evening in the Garden. And I pinned it too! Thanks for the giveaway! I pinned it 🙂 oh how im hoping i win this!!! And lastly i totally liked it on facebook because this awesome!!! Tweeted the giveaway. I’m embmimi. Posted on Facebook as Beth J. Beal! Put it on my facebook!! I also subscribe to FAT Quarter! I LIKED this on my facebook. Pinned on Pinterest – Miscellaneous Board. I’ve liked this on Facebook and pinned it! My username for both is Teresa Hereford Banks. I pinned, fb’d, and tweeted, thanks for this awesome giveaway! What an awesome giveaway, thanks for the opportunity! I’ve pinned this! 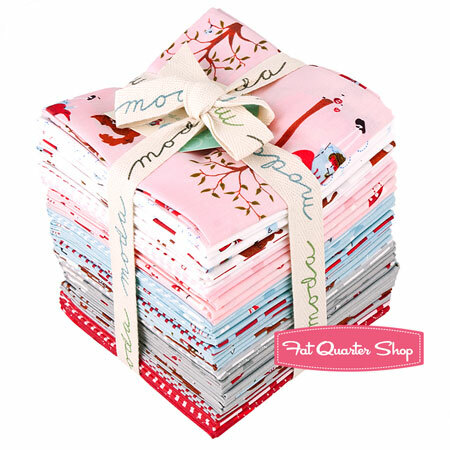 Thanks, Kim, for working with Fat Quarter Shop on this great giveaway. I’d love to tell my husband that the fabric that arrives in the mail is something I ‘won’ rather than something I bought. He’s getting very persnickety lately about my buying habits…. So for now, see my Tweet at MtnQuiltworks! I’ve pinned the logo at Barb Neiwert on Pinterest! I don’t use Google+, until today! So I’ve shared the contest via haileybarb at gmail dot com. I’ve shared the contest on FB at Mountain Quiltworks! Awesome giveaway, and you know I love it! 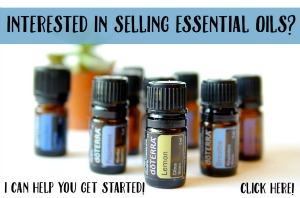 Shared on FB and Pinterest, and am already a newsletter subscriber. Four extra entries for me! 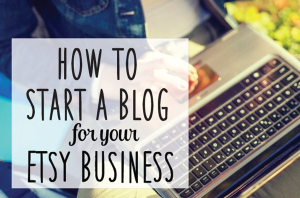 I’ve pinned it, shared it on Facebook, tweeted it and shared it on Google+! Thanks for an awesome contest! Moda fabric is wonderful. I discovered them in MollyMakes creating craft magazine. Super fast shipping just like you said. I shared this on google+. Hey.. I gave this a retweet, though i did want to keep this awesome give away to my self. LOOOVED it on FB too. I Pinned it and Facebooked it (both accounts are Elle Morgan-Thomas), and also Tweeted it (@elle_m_t). Wahoo, yay for giveaways! I stumbled this as LarissaEsq. I google +’d it! Almost didn’t want too so my friends wouldn’t get the giveaway hehe jk. Tweeted it! Crossing my fingers. I also Pinned the giveaway. And I “liked” on Facebook as Jenelle Clark. I liked it on facebook, and I love the fat quarter shop so thank you for the giveaway! Shared the giveaway on Linkedin, my account name is Pam Radford. I shared the giveaway on Google +. I just pinned it! I’m Brook B there. I tweeted it as CutesyBootsie. pinned athttp://pinterest.com/diane_standish/ under bags and purses and totes oh my! Have subscribed to your newsletter. Hope win some designer fabric here as we dont get them in India. I shared your FB link for the contest in Singer Futura Fans FB group this morning! I publicly +1’d this as Oksana V.
+1 G. Fuqua366 (at) gmail (dot) com. I shared the giveaway on google + Hope I win! Love their fabrics!! I liked it on Facebook. I have a special project call “Benjamin Smiles” and need fabric scraps. Please take a look.